OK Go is an American rock band from Chicago, Illinois, that is composed of Damian Kulash (lead vocals, guitar), Tim Nordwind (bass guitar and vocals), Dan Konopka (drums and percussion) and Andy Ross (guitar, keyboards and vocals. The band is best known for their elaborate and visually stunning one-take music videos. The song “The Writing’s On The Wall” is the first single off their fourth studio album, Hungry Ghosts. The song was released in June 2014, along with the music video, which quickly went viral like the majority of their videos. 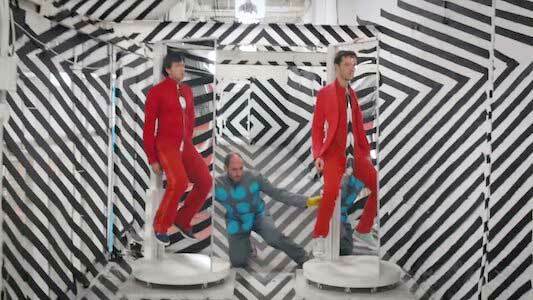 The video for “The Writing’s On The Wall” has accumulated over 23 million views on YouTube, making it one of OK Go’s more popular videos. Lead singer Damian Kulash wears a pair of cyan blue chucks in the video. The song is about the strained relationship between a man and a woman, and how they both can see that this relationship is not meant to last. To highlight this theme, the vocals for the song have a serious, and, when paired with the spacey synths and a flanged clean guitar, add a eerie level of melancholy. The beat itself is actually rather upbeat which may seem strange at first when you consider the song is about a couple who hasn’t had a good day “in forever”. However, this seems to illustrate the idea that the couple may seem happy on the outside to some people, they are, at their core, rather miserable together. There’s a sad, chewy center in this candy bar of happiness. The band experiments with different colors and perspectives in this video. This music video is shot in one take like the majority of OK Go’s music videos, which adds an extra level of awe to the visuals provided. Most of the band’s videos have a visual theme, with this particular video’s theme being that of visual perception. This is demonstrated by the constantly shifting camera and specifically placed props and artwork on the bare warehouse set. The band is dressed in brightly colored coveralls that are layered over a variety of clothes, all of which match up with different settings and shapes throughout the video. Lead singer Damian Kulash wears a pair of cyan blue chucks throughout the video, while drummer Tim Nordwind is wearing a pair of black Converse One Stars. Kulash’s chucks really pop amongst the backgrounds and grey floor, allowing them to stand out amongst his ever shifting wardrobe. There really isn’t much to describe about the video because it is so reliant on visuals. It something that definitely needs to be seen to believe, so make sure you check it out! 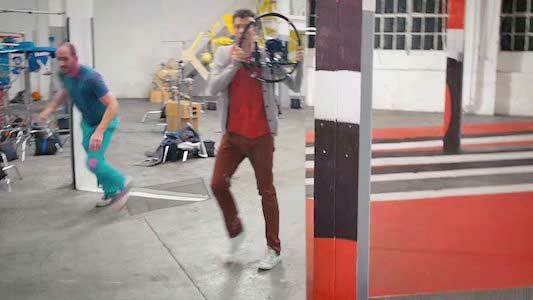 The band utilizes a gyroscopic gimbal that helps shift the camera’s perspective in new and inventive ways. Click on the links below to get a new pair of chucks to wear in your video.